Japanese astronaut Soichi Noguchi posted this photo of the shuttle Endeavour as seen from the International Space Station's new Cupola lookout windows on his Twitter page Feb. 18, 2010 during NASA's STS-130 mission. Thisstory was updated Feb. 19 at 5:16 a.m. ET. Astronautsaboard NASA?s shuttle Endeavour packed up their spaceship for the trip homeThursday after more than a week at the International Space Station, but notbefore holding a grand opening ceremony for the orbiting lab?s newest room andstunning observation deck. Shuttlecommander George Zamka and station skipper Jeffrey Williams, equipped withceremonial red ribbon and scissors, officially opened the station?s new Tranquilitymodule and its seven-windowobservation deck. "Arguablymankind has been after this view for centuries, this perspective, this view ofthe world,? Zamka said. ?We finally have it and we are going to take advantageof and enjoy it." Williamssaid he will remember this moment for the rest of his life, especially theviews out the observation deck, which NASA calls the Cupola. ?Itculminates just about the assembly complete of the space station, getting us tofull capability,? he said. ?So, this Cupola means a whole lot." Ashort time later, the two crews bid early farewells to one another and shared heartyhugs as they locked the hatches between their two spacecraft. Endeavour is dueto undock from the space station Friday evening. ?It?sbeen an awesome mission. You guys did a great job,? Williams told the shuttlecrew. Zamkamarked the Cupola?s opening by presenting a plaque containing four chips from amoon rock and a fragment taken from the top of Mt. Everest, the tallestmountain on Earth. TheEverest rock was collected by a former astronaut last year. The moonrock samples, however, were retrieved from the Sea of Tranquility duringNASA?s Apollo 11 mission ? the first manned lunar landing ? in July 1969. Thenew station room is named in honor of that mission. ?Theywill be placed in the Cupola as a reminder of man's reach and man's grit asthey go out and explore," Zamka said. Williamsdedicated the new space windows to the memory of the late astronaut Lacy Veach,who died of cancer in 1995 and was involved in the Cupola?s early development.Williams placed a patch with Veach?s name in the observation deck and his photoon the station?s airlock. Endeavourpilot Terry Virts said the panoramicview of Earth out those seven windows took his breath away. Sunrises overthe curve, or limb, of the Earth have been his favorite. ?Whenyou pass into the sunlight, you get the blue limb and then it turns into pink,and different colors like that. And then when the sun pops up, it?s like aninstantaneous flood light in your eyes,? Virts said with emotion whileanswering questions from reporters late Thursday. ?The view is amazing.? 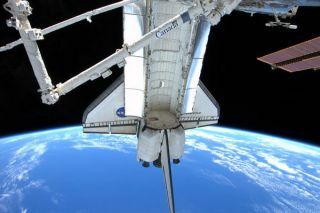 Endeavourspacewalker Robert Behnken said the view may be even better than from outsidethe space station in a spacesuit. After all, you can take your time and lookout the windows in every direction. Spacewalking astronauts must steal glimpsesof the Earth during brief rest periods. Aftermeeting the press, the shuttle and station astronauts had one last lunchtogether as they prepared to go their separate ways. They expected to have funbefore saying their farewells. Shuttleastronaut Nicholas Patrick, a native of England, acknowledged that there is apub-like feeling onboard. ?There?sa lot of the friendly atmosphere up here,? Patrick said. ?If we had a beer uphere, it would make the best pub in the world.? Theshuttle launched to the space station Feb. 8 to deliver the station?s newTranquility module and a seven-window lookout called the Cupola. It took threespacewalks and some tricky robotic arm work to install them. Together,the new additions cost nearly $409 million. They were built in Italy for NASAby the European Space Agency and leave the now 11-year-old space station 98percent complete. Endeavour?sSTS-130 mission is the first ofNASA?s five final shuttle missions. The space agency plans to retire its threeaging shuttles this fall and is looking to commercially built spacecraft toreplace them. MissionControl said the astronauts may not have snow or ice on the station, butthey?re worthy of Winter Olympics gold. ?Congratulations on a docked mission of?Olympic? proportions,? Mission Control told the shuttle astronauts in amessage tucked away in their morning mail. ?You are officially the only folkswho are able to get more hang time then Shaun White.? White,the American snowboarder, took the gold Wednesday night in the men?s halfpipeat the 2010 Winter Olympics in Vancouver, Canada. Japaneseastronaut Soichi Noguchi said he?s been trying to keep up with the Olympicsusing the space station?s Internet connection. White?s snowboarding win aside,Noguchi said he?s looking forward to the results of the ski jumping events andfigure skating. SPACE.comis providing complete coverage of Endeavour's STS-130 mission to theInternational Space Station with Managing Editor Tariq Malik and Staff WriterClara Moskowitz based in New York. Clickhere for shuttle mission updates and a link to NASA TV.